Čabalová, I., Zachar, M., Kačík, F., and Tribulová, T. (2019). "Impact of thermal loading on selected chemical and morphological properties of spruce ThermoWood," BioRes. 14(1), 387-400. 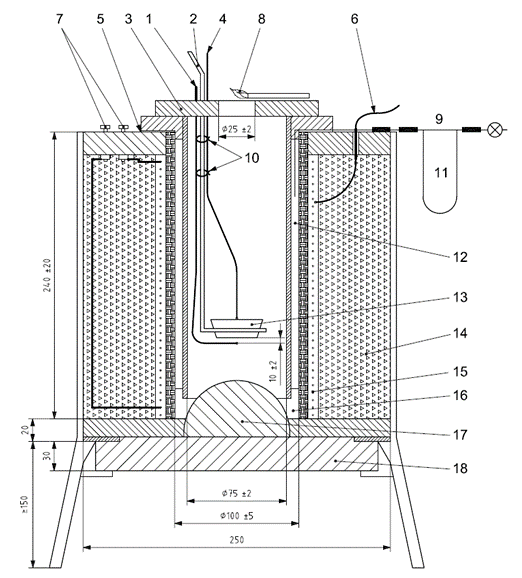 Physico-chemical changes to ThermoWood produced from Norway spruce (Picea abies L.) with the dimensions 20 mm × 20 mm × 10 mm were evaluated as a function of thermal loading at a flame ignition temperature (FIT) and spontaneous ignition temperature (SIT). The extractives, cellulose, holocellulose, and lignin contents were determined by wet chemistry methods. Carbohydrates and cellulose changes were investigated by high-performance liquid chromatography and size exclusion chromatography. The dimensional characteristics of the fibers (length, width, and shape factor) were measured. After thermal loading, an increase in both the cellulose (FIT – 33.1%, SIT – 64.6%) and lignin (FIT – 28.3%, SIT – 63.4%) contents and a decrease in the extractives content (approximately 8% to 9%) were observed. The increase in the cellulose content was attributed to structural changes (carbonization and crosslinking). The lignin content increased because of condensation and its greater thermal stability compared with carbohydrates. After the thermal treatment, saccharides content was lower due to degradation of non-glucosic saccharides (mainly pentosans – 51.3%). The cellulose degree of polymerization decreased by 40.8% during thermal loading at the FIT and by up to 75.4% at the SIT. Thermal loading of ThermoWood samples caused a significant decrease of fibers average width. Wood is used as a building material in various forms because of its advantageous structural properties (relatively high strength at a comparatively low weight and large expansion) and positive physical and mechanical properties. In addition to its technical and aesthetic advantages, it creates a positive psychosomatic microclimate. It is an inexhaustible and renewable raw material when properly managed with a natural durability and resistance to damage. However, it does have negative characteristics, including being able to be degraded by biotic and abiotic factors. Wood can be thermally modified (mechanically, chemically, thermally, and enzymatically) to improve some of its properties. Thermal modification of wood (high temperatures of 150 °C to 260 °C) improves the wood resistance to biological degradation (Militz 2002; Weinland and Guyonnet 2003; Reinprecht 2016) and weathering (Brischke and Rapp 2004; Reinprecht and Vidholdová 2011). Simultaneously, its aesthetic value (from changes in its color, such as darkening and gloss change) (Kačíková et al. 2013; Kubovský and Kačík 2014; Kubovský et al. 2016), dimensional stability, thermal insulation (Reinprecht and Vidholdová 2011), and acoustic properties (Barlow 1997; Pfriem et al. 2005) can be improved. Also, the wood hygroscopicity is reduced (Reinprecht and Vidholdová 2011). The main disadvantage of thermally modified wood (e.g., ThermoWood) compared with untreated wood is a deterioration of most of its mechanical properties, in particular the impact strength, strength, and hardness. In contrast, some properties can be improved, e.g., the modulus of elasticity and hardness under certain conditions (Hale et al. 2005). Thermally modified wood is often used in interior applications, e.g. various tiles, parquet, interior panels, kitchen and bathroom furniture, floors, wall panels, and sauna benches. ThermoWood with a higher durability and improved dimensional stability is also used in exterior applications. However, to a greater extent, thermally modified wood is only used for the third threat classes without permanent contact with terrain, such as exterior facades, windows, exterior doors, fencing above ground level, garden furniture, gazebos, and other similar uses. In general, the fire resistance of thermally modified wood is consistent with that of the original wood, but its potential for smoke formation is lower in the case of fire (Wang and Cooper 2007; Čekovská 2017a,b; Osvald and Gaff 2017). The ignition of wood occurs with a sufficient amount of initiating heat energy, wherein the temperature of ignition/flashing of the wood is within the range of 250 °C to 400 °C (Kubš et al. 2016; Reinprecht 2016). Changes in the chemical structure of the wood associated with less intensive dehydration processes occur at temperatures around 100 °C, which may be less important. Thermal loading of wood causes many changes in the different wood components (in matrix of cellulose, hemicelluloses, lignin, and extractives). The chemical changes start with deacetylation of hemicelluloses at the beginning of thermal loading. This is followed by depolymerisation, which is catalysed by the released acetic acid. Simultaneously, hemicellulose undergoes dehydration, resulting in a decreased amount of hydroxyl groups (Weiland and Guyonnet 2003). Both lignin and cellulose are more stable polymers compared to hemicelluloses (Tjeerdsma et al. 1998). The thermal degradation of wood and its chemical structure are influenced by the intensity of the supplied heat, oxygen available to the material, ambient pressure, wood type and shape, initial moisture content of the wood (Shafizadeh 1984; Militz 2002; Hill 2006), and additives, such as inorganic substances, sorbed emissions, etc. (Fengel and Wegener 2003; Reinprecht 2016). For a comprehensive assessment of all of the factors that influence the possibility of fire emergence, it is especially necessary to know the characteristic properties of substances, the so-called fire-technical parameters, which are a quantitative expression of the possibility of fire emergence and the chemical composition of the wood. The chemical and mechanical changes to wood after thermal modification are relatively well researched, but studies on the dimensional changes to the fibers, which may mainly affect the mechanical properties, have not been published yet. Therefore, the aim of this paper was to characterize the extractives, lignin, and polysaccharides contents, molecular weight, polydispersity (PD), degree of polymerization (DP), and dimensional characteristics of the cellulose fibers (length, width, and shape factor) after thermal loading of ThermoWood produced from Norway spruce (Picea abies L.). The Norway spruce (Picea abies L.) ThermoWood used for testing was obtained from the company Stora Enso (Uimaharju, Finland). The samples were thermally modified with the thermal program for ThermoWood Thermo-S production. The average density of the ThermoWood is 358 kg/m2 ± 4 kg/m2. Unsanded samples with the dimensions 20 mm × 20 mm × 10 mm were conditioned (STN ISO 871 2010) at a temperature of 23 °C ± 2 °C and a relative air humidity of 50% ± 5% for at least 40 h to the final sample moisture content of 12% (STN EN ISO 291 2008). The flame ignition temperature (FIT) and spontaneous ignition temperature (SIT) were determined according to STN ISO 871 (2010). Measurements were performed on 10 replicates per sample. During the test, the material was heated in a heating chamber at different temperatures. By positioning a small pilot flame impinging on the opening cover of the hot-air furnace, the released gases were ignited, which allowed the FIT to be determined. The SIT was determined using the same method, but without igniting the flame. The temperature course in the furnace was measured using thermocouples (type K) with a diameter of 0.5 mm; a data logger (ALMEMO® 710, Ahlborn, Ilmenau, Germany) was used to record the temperature (Fig. 1). The ThermoWood samples were disintegrated into sawdust, and fractions 0.5 mm to 1.0 mm in size were used for the chemical analyses. The extractives content was determined in a Soxhlet apparatus with a mixture of ethanol and toluene (2:1) according to ASTM D1107-96 (2007). The lignin content was determined according to Sluiter et al. (2012), and the cellulose content was determined according to the method by Seifert (1956). Measurements were performed on four replicates per sample. The results were presented as oven-dry wood percentages. The samples were hydrolysed using 72% (w/w) sulfuric acid, and the neutral saccharides content was determined according to Sluiter et al. (2012). Quantitative analyses of the saccharides were performed with high-performance liquid chromatography (HPLC) on an Agilent 1200 chromatograph (Agilent, Santa Clara, CA, USA), Aminex HPX – 87P column (Bio-Rad, Hercules, CA, USA), and refractive index detector. The injected volume was 20 μL, deionized water was used as the mobile phase, the flow rate was 0.6 mL/min, and the temperature was 80 °C. Measurements were performed on four replicates per sample. The results were presented as oven-dry wood percentages. Cellulose samples were derived using phenyl isocyanate to obtain cellulose tricarbanilates (CTC) that were dissolved in tetrahydrofuran prior to size exclusion chromatography (SEC) analysis. The derivatives were prepared according to the procedure previously described by Kačík et al. (2016). The SEC analyses were performed at 35 °C with tetrahydrofuran at a flow rate of 1 mL/min on two PLgel MIXED B columns (10 μm, 7.5 mm × 300 mm), preceded by a PLgel GUARD column (10 μm, 7.5 mm × 50 mm). Two CTC derivatives were prepared for each sample and each derivative was analyzed twice. The cellulose DP values were calculated by dividing the weight-average molecular weight (Mw) of the measured samples by the Mw of the CTC repeat unit (DP = M/519). The polydispersity (PD) was calculated by dividing the Mw by the number-average molecular weight (Mn). Measurements were performed on four replicates per sample. Two hundred-milliliter mixtures of concentrated CH3COOH and 30% H2O2 (1:1, v/v) were poured onto the wood samples (weight = 10 g and dimensions = 20 mm × 2 mm × 2 mm). Then, the samples were refluxed for 3 h, suction filtered through a sintered glass filter (S1), and washed with distilled water. An L & W Fiber Tester (Lorenzen & Wettre, Kista, Sweden) was used to determine the fiber dimensional characteristics. This measurement is based on the principle of two-dimensional imaging technology. The measurement technology is automated, allowing for frequent and rapid analysis of the fiber quality. The instrument measures various fiber properties, such as the length and width of the fibers, shape factor (aspect ratio of the displayed line length between the ends of the fibers to the actual length of the fiber (length along the outline of the fiber)), fine portion (0.1 mm to 0.2 mm), and coarseness (fiber mass in μg per unit of fiber length). Measurements were performed on a single replicate per sample, and the number of fibers within each population of replicate ranged from 19658 cells to 20543 cells. Data were analysed using one-way analysis of variance, and Duncan’s tests at a 5% confidence level were used for comparisons of means. The ThermoWood samples reached the SIT of 418 °C in 360 s and the FIT of 346 °C in 538 s. There was a 72 °C difference between the SIT and FIT. The average SIT value was comparable with past results from other authors. The SIT values for spruce wood and wood products (wood dust, native wood, pellets, etc.) have been found to range from 430 °C to 488 °C (Hagen et al. 2009; Zachar et al. 2012; Martinka et al. 2015). Martinka et al. (2014) determined the SIT of both thermally unmodified (420 °C) and thermally modified (410 °C) samples for the dust cloud formed by particles with dimensions less than 71 μm, a 0.5-g sample mass, and a 50-kPa air pressure. 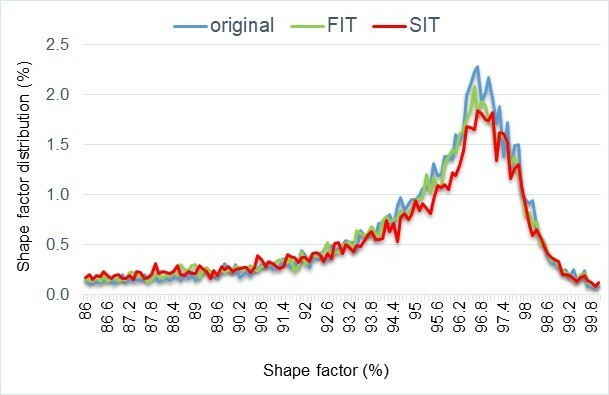 Babrauskas (2002) gave a detailed overview of both the FIT and SIT, which ranged from 210 °C to 497 °C for the flash point and from 200 °C to 510 °C for ignition, depending on the type of wood and the test method used. Delichatsios et al. (2003) reached a SIT of 478 °C during testing of Australian pine wood. Van Blijderveen et al. (2010) found that the SIT ranged from 230 °C to 255 °C for a duration of 300 s for wood chips prepared from a forest tree species mix with a moisture content of 10% to 25%. It is interesting to note that the remarkably lower temperatures were because of the higher moisture content. An increased temperature (FIT = 346 °C, SIT = 418 °C) had a remarkable influence on the degradation of individual wood components. The amount of cellulose and lignin increased considerably, and conversely the extractives and holocellulose contents decreased (Table 1). In thermally degraded wood, cellulose is subject to charring, which causes a relative increase in its amount when determined according to the Seifert method (Čabalová et al. 2013). The results of this study showed that the amount of cellulose increased by 57.8% (FIT) and 71.4% (SIT). An increased amount of lignin was also observed with an increased temperature. One of the reasons for this was the occurrence of condensation reactions with carbohydrate degradation products, as well as autocondensation of the lignin itself. A major increase of 38.1% (FIT) and 48.6% (SIT) was measured for the lignin content. Similar changes in the lignin content have been observed by other authors (Nuopponen et al. 2004; Zachar et al. 2017). It was concluded that a remarkable increase in the lignin yield occurs at temperatures above 200 °C. This was because of the greater thermal stability of lignin compared with that of hemicellulose, as well as condensation reactions with carbohydrate degradation products. An increased lignin content has also been observed when different heating methods are used (Nuoponnen et al. 2004; Inari et al. 2007; Windeisen et al. 2007). The differences are caused by a thermal action resulting in structural changes to the lignin. In addition to condensation reactions, lignins are subject to degradation, especially if the conditions of the thermal action are milder (Kačík et al. 2006; Brebu and Vasile 2010). Kučerová et al. (2011) investigated changes in the extractives after thermal degradation of spruce wood. It was found that the extractives content in the thermally modified spruce timber had increased. In the present study, the opposite trend was observed, i.e., there was a slight decrease in the extractives content in the thermally modified samples compared with that of the original samples. The observed effect was probably because of the both samples variety and different types of thermal action. GLC(HEMI) – D-glucose as a part of the hemicellulose; GLC(CEL) – D-glucose as a part of the cellulose; GLC(SUM) – GLC(HEMI) + GLC(CEL); XYL – D-xylose; GAL – D-galactose; ARA – L-arabinose; MAN – D-mannose; data are the mean percentages of the oven-dry wood ± standard deviation; * absolute content. 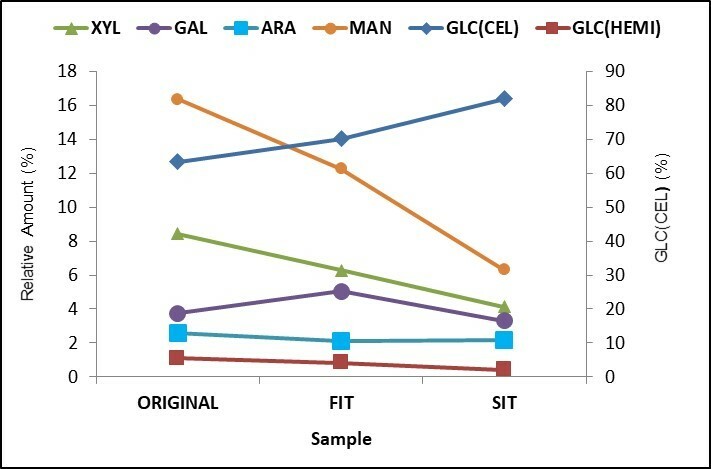 From the obtained HPLC results it was apparent that the thermal loading of the samples caused a decrease in the relative content of the hemicellulose-type saccharides, D-xylose (XYL), D-galactose (GAL), L-arabinose (ARA), and D-mannose (MAN), which are the least resistant to heat (Fig. 2). The resistance of individual saccharide types to high temperatures differed depending on the individual wood species. Pentosans are generally more unstable than hexosans, and during the course of this experiment, they degraded to a greater extent at the SIT (pentosans decreased by 51.3% and hexosans decreased by 7.0%). Changes in hemicelluloses that occur because of thermal treatment largely affect the mechanical properties of a material (Boonstra et al. 2007). Among the major wood components, hemicelluloses are the most susceptible to thermal degradation, even at relatively low temperatures. Deacetylation and formation of acetic acid occur from the beginning of hemicellulose degradation and the formed acid catalyzes the hydrolysis of glycoside bonds in the polysaccharides. During the heat treatment process, liberated acetic acid can catalyze dehydration and condensation reactions of carbohydrates (Nuopponen et al. 2004). The previous research by the authors showed that the degradation process of saccharides in spruce wood by thermal treatment was fastest in mannose, slower in xylose, and slowest in galactose (Čabalová et al. 2013). When comparing the previous findings with the experimental results obtained in this study, it can be stated that the greater cellulose stability compared with the hemicellulose stability was consistent with many published works (Tjeerdsma et al. 1998; Esteves et al. 2008; Windeisen and Wegener 2009; Poleto et al. 2012; Čabalová et al. 2018). The random cleavage of the glycosidic linkage in cellulose occurs between 275 °C and 350 °C (Kim et al. 2006), and this random cleavage can lead to a rapid decrease in the DP. In contrast, some decomposition products undergo condensation reactions with other degradation products (e.g., from the hemicelluloses and lignin), which results in apparent cellulose that is non-soluble in the acetylacetone-dioxane-HCl mixture using the Seifert method. Thus, the cellulose yields (Table 1) did not represent the true cellulose content. By analyzing the fiber lengths and their distribution in the sample, it was found that because of the higher thermal load temperature, the proportion of shorter fractions increased and the number of longer fractions decreased (Fig. 4). 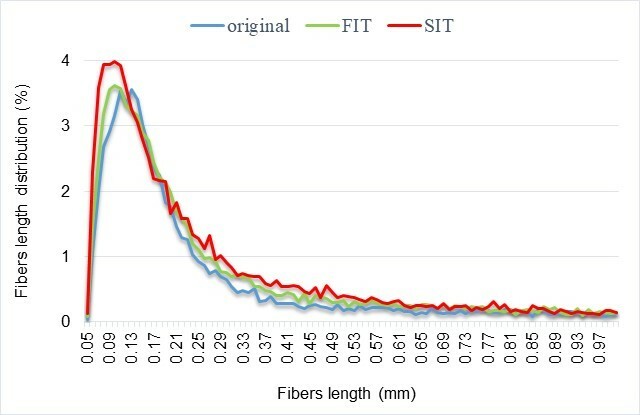 The largest proportion of fibers was contained in the length class of up to 0.50 mm (55.9% in the original sample, 62.8% in the FIT loaded sample, and 69.7% in the SIT loaded sample). The biggest changes were detected in the length class of 1.01 to 3.50 mm. The original sample contained a fibers proportion of 36.1%. A remarkable decrease in this fibers fraction was observed in the thermally loaded samples (25.7% with the FIT and 47.9% with the SIT). In general, the length of the fibers in the thermally loaded wood decreased. The previous paper by the authors described morphological changes of thermally loaded alder and birch wood. An increase in the number of shorter fractions occurred because of the thermal degradation of these wood species. The degree of fiber degradation depends on the type of wood and thermal loading temperature (Čabalová et al. 2017). The second measured parameter was the width of the fibers (Fig. 5). 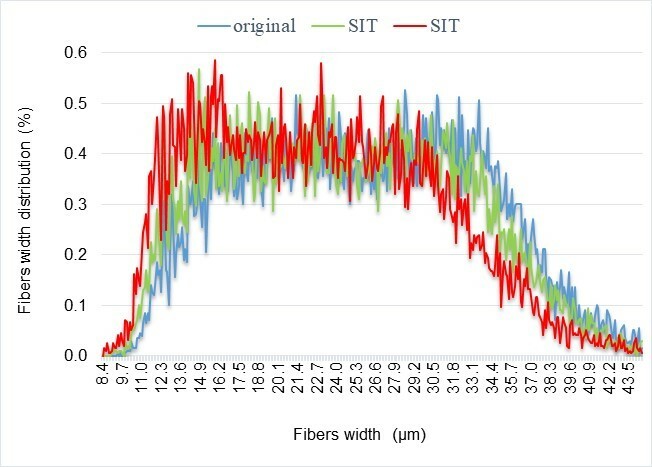 Approximately 33.5% of the fibers in the original sample, 27.8% in the FIT-loaded sample, and 19.6% in the SIT-loaded sample were detected in the width class of 30.0 μm to 63.2 μm. Fibers with widths between 15.1 μm and 30.0 μm were the most common (57.9% in the original sample, 60.0% in the FIT-loaded sample, and 62.8% in the SIT-loaded sample). 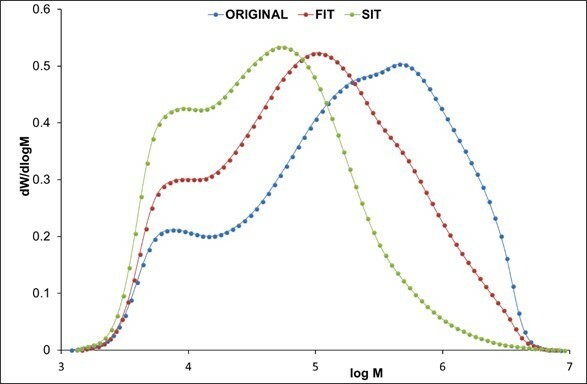 In the width class of 8.4 μm to 15.0 μm, 8.61% of the fibers in the original sample, 12.2% in the FIT-loaded sample, and 17.6% in the SIT-loaded sample were present. From the results given above, it was found that the fiber width decreased with an increasing temperature. The shape characteristics of the fibers were also examined (Fig. 6). From the observed results, it was apparent that the thermal load caused a reduction in the shape factor because of fiber twisting. Higher values meant flatter fibers. Approximately 53.3% of the fibers in the original samples, 49.6% in the FIT-loaded samples, and 45.9% in the SIT-loaded samples were detected in the class ranging from 95.1% to 100%. In the class from 90.1% to 95.0%, 24.1% of the fibers in the original samples, 24.2% in the FIT-loaded samples, and 23% in the SIT-loaded samples were present in the distribution. In the class from 40.0% to 90.0%, 22.6% of the fibers in the original samples, 26.1% in the FIT-loaded samples, and 31.1% in the SIT-loaded samples were present. Statistical analysis of the examined trait linkages revealed that all traits affected other characteristics. 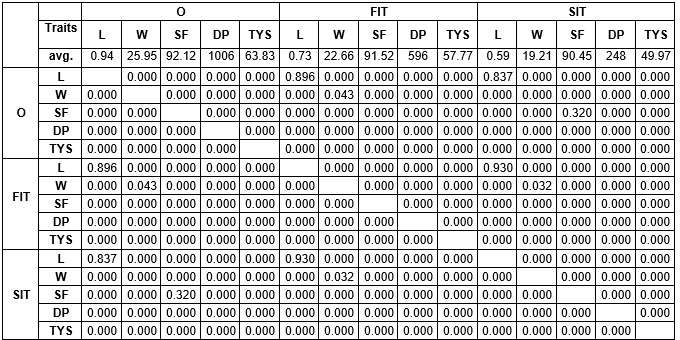 Correlation coefficients among the examined traits are presented in the Table 3. Within the examined wood samples, significant relationships were found between each trait, except both average fibers length and shape factor decreased due to the thermal loading. The ThermoWood samples reached the average SIT of 418 °C in 360 s and the average FIT of 346 °C in 538 s.
The lignin content increased with a higher thermal loading temperature because of autocondensation and its higher thermal stability. There was a slight decrease in the extractives content. In general, the cellulose Mw and DP decreased (DP decreased by 40.8% with the FIT and by up to 75.4% with the SIT), while cross-linking reactions occurred in the cellulose. The dimensional characteristics, such as the fiber length, width, and shape factor, decreased with a higher thermal loading temperature. 6. Significant relationships between each trait due to the thermal loading, except both average fibers length and shape factor decrease was observed. This work was supported by funding from the Slovak Research and Development Agency (Contract No. APVV-16-0326 (50%)) and the Slovak Scientific Grant Agency VEGA (Contract No. 1/0387/18 (50%)). Babrauskas, V. (2002). “Ignition of wood: A review of the state of the art,” in: Interflam 2001: 9th International Fire Science and Engineering Conference, Edinburgh, Scotland, pp. 71-88. Barlow, C. Y. (1997). “Materials selection for musical instrument,” in: Proceedings of the Institute of Acoustics, Edinburgh, Scotland, pp. 69-78. Brischke, C., and Rapp, A. O. (2004). Investigation of the Suitability of Silver Fir (Abies alba Mill.) for Thermal Modification (IRG/WP/04-40275), International Research Group on Wood Protection, Stockholm, Sweden. Čabalová, I., Kačík, F., Kačíková, D., and Oravec, M. (2013). “The influence of radiant heating on chemical changes of spruce wood (in Slovak),” Acta Facultatis Xylologiae 55(2), 59-66. Čabalová, I., Zachar, M., and Toman, B. (2017). “Characterization of thermally loaded woods species in the view of physical-chemical and fire technical properties,” in: Fire Protection, Safety and Security 2017, Zvolen, Slovakia, pp. 22-36. Fengel, D., and Wegener, G. (2003). Wood: Chemistry, Ultrastructure, Reactions, Verlag Kessel, Remagen, Germany. Hale, M. D., Ghosh, S. C., and Spear, M. J. (2005). Effects of Artificial UV Weathering and Soft Rot Decay on Heat Treated Wood (IRG/WP/05-40302), International Research Group on Wood Preservation, Stockholm, Sweden. Hill, C. A. S. (2006). Wood Modification – Chemical, Thermal and Other Processes, John Wiley & Sons Ltd., Chicester, UK. Kačík, F., Kačíková, D., and Bubeníková, T. (2006). “Spruce wood lignin alterations after infrared heating at different wood moistures,” Cell. Chem. Technol. 40(8), 643-648. Kučerová, V., Kačíková, D., and Kačík, F. (2011). “Alterations of extractives and cellulose macromolecular characteristics after thermal degradation of spruce wood (in Slovak),” Acta Facultatis Xylologiae 53(2), 77-83. Martinka, J., Kačíková, D., Rantuch, P., and Balog, K. (2014). “Influence of thermal modification of spruce wood on the ignition temperature of wood dust cloud,” Acta Facultatis Xylologiae 56(1), 87-95. Martinka, J., Mózer, V., Hroncová, E., and Ladomerský, J. (2015). “Influence of spruce wood form on ignition activation energy,” Wood Res.-Slovakia 60(5), 815-822. Militz, H. (2002). Thermal Treatment of Wood: European Processes and Their Background (IRG/WP 02-40241), International Research Group on Wood Preservation, Stockholm, Sweden. Osvald, A., and Gaff, M. (2017). “Effect of thermal modification on flameless combustion of spruce wood,” Wood Res.-Slovakia 62(4), 565-574. Pfriem, A., Wagenführ, A., Ziegenhals, G., and Eichelberger, K. (2005). “The use of wood modified by heat-treatment for musical instruments,” in: Wood Modification: Processes, Properties and Commercialisation – 2nd European Conference on Wood Modification, Göttingen, Germany, pp. 390-397. Reinprecht, L. (2016). Wood Deterioration, Protection and Maintenance, John Wiley & Sons, Chichester, UK. Reinprecht, L., and Vidholdová, Z. (2011). Termodřevo [Thermowood], Šmíra-print, Ostrava, Czech Republic. Seifert, V. K. (1956). “Űber ein neues verfahren zur schnellbestimmung der rein-cellulose [About a new method for rapid determination of pure cellulose],” Das Papier 10(13/14), 301-306. Shafizadeh, F. (1984). “The chemistry of pyrolysis and combustion,” in: The Chemistry of Solid Wood, R. M. Rowel (ed. ), American Chemical Society, Washington, DC, pp. 489-529. Sluiter, A., Hames, B., Ruiz, R., Scarlata, C., Sluiter, J., Templeton, D., and Crocker, D. (2012). Determination of Structural Carbohydrates and Lignin in Biomass (NREL/TP-510-42618), National Renewable Energy Laboratory, Golden, CO.
STN EN ISO 291 (2008). “Plastics. Standard atmospheres for conditioning and testing,” Slovak Standards Institute, Bratislava, Slovakia. STN ISO 871 (2010). “Plastics. Determination of ignition temperature using a hot-air furnace,” Slovak Standards Institute, Bratislava, Slovakia. Wang, J., and Cooper, P. A. (2007). Fire, Flame Resistance and Thermal Properties of Oil Thermally-treated Wood (IRG/WP/07-40361), International Research Group on Wood Protection, Stockholm, Sweden. Zachar, M., Majlingová, A., Mitterová, I., and Čabalová, I. (2017). “Influence of an age and damage of the oak wood on its fire risk,” Wood Res. 62(3), 495-504. Article submitted: June 28, 2018; Peer review completed: September 9, 2018; Revised version received and accepted: November 16, 2018; Published: November 21, 2018.